We individually number each piece we craft with an authentic vintage date nail. Reclaimed from abandoned rail beds, these tiny industrial era artifacts served as quality control markers for the railroads. Solid North American hardwood timber goes into every crosstie made in the USA from the 1800s to today. And up until the 1960s, every one of those timbers was individually numbered and marked with a date nail. Mostly made of steel and some of copper, they all possess that rich patina that can only be achieved through natural weathering over decades spent exposed to the elements. These tiny "spikes" came in all shapes and sizes numbering from 1 up to 69 typically. While the round shape wins out as the most common; square, triangular and hexagon shapes are also to be found. Often hand-crafted, the letters and numbers may be raised or indented, but they almost always have the appearance of being made by hand. 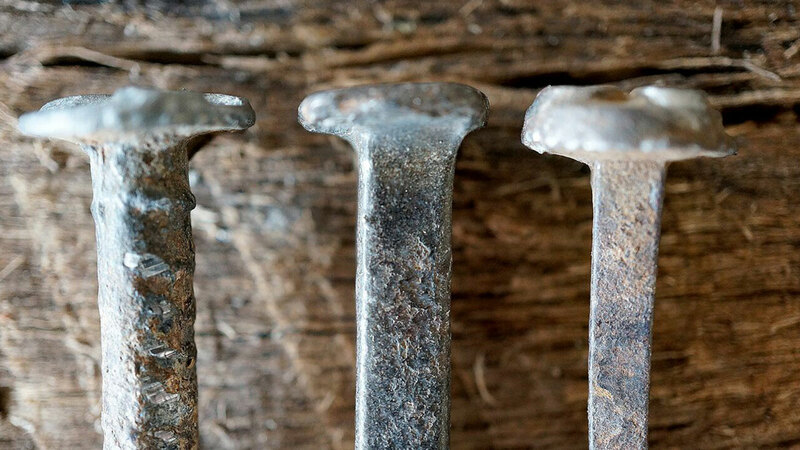 The nails captured the year of manufacture and other critical information, but their real importance was for quality control. Date nails provided a means to determine the effects of weather and other conditions on the various wood species. Oak, hickory and elm each have uniquely beautiful grain patterns, and also unique characteristics when it comes to weathering. For example, while oak is plentiful in the southeast, hickory and other woods fare better in the hotter and more humid climates like those around Atlanta and New Orleans. In the mountains, timber weathers better in the dry high desert like conditions of Utah and Wyoming, and softer woods may suffice for the railroads. Many a date nail collector will go out in search of these little relics, but remember that railroad tracks are a dangerous place, and trespassing on the tracks is a punishable offense. If you’re interested in getting hold of a date nail, we’d suggest picking up one of our tables or desks. You’ll find a date nail in every one we make. The 21 date nail pictured here was featured on one of our Streamliner Benches. Click here to see what benches and other seating we have currently available in stock.